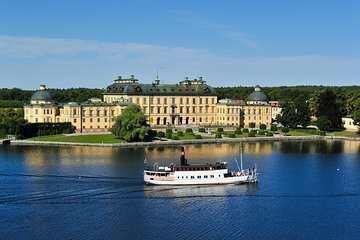 Drottningholm Palace is located on an island in Lake Malaren, west of Stockholm. It is Unesco's World Heritage Site. You can catch a boat which departs from Stadshuskajen central Stockholm. It is the City Hall Quay. It is a nice ride along the river and it takes 50 minutes to an hour to get to the palace. You can have lunch or a drink on the boat. When you see the palace you get off. The palace is the King and Queen's home, with State Apartments that are open to the public all year round. It truly is a unique location to visit. Very nice tour to Drottingholm - beautiful and serene. Would have been nice to have a guide human or recorded provide some historic information during the cruise to the castle. The castle was beautiful, and I'm glad that I went guide or no guide. Boat to palace was so full, the day was especially hot and everyone was packed like sardines in the limited outdoor space. Palace was pretty but you don't really need more than an hour there. If you want to stay longer, pack a picnic and eat outside in the gardens. Boat back was great!